Riverside has a wide selection of folding boxes for business cards. 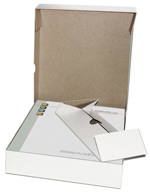 Choose our Glossy White Business card boxes, or economical Matte White Business Card Boxes. The Classic Misty Gary Folding business card boxes are also available.